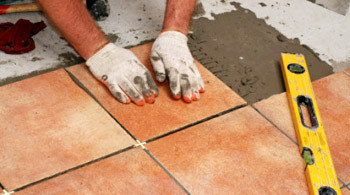 Ceramic tile is both one of the easiest floors to install yourself and the most difficult. 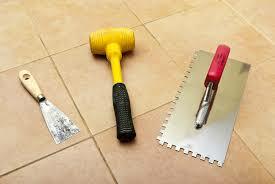 Home centers especially encourage you to tackle DIY tile installation. All you need is take a Saturday installation clinic out in the parking lot, buy a few tools and install materials inside, and you're ready to go. And for simple jobs, it just may well be. But there are a number of factors that could increase the technical difficulty well beyond the skills of most DIYers. For starters, unlike other floors, most ceramic and porcelain installations can be unforgiving. Also, tile won't give like other flooring materials -- not an inch -- so the subfloor has to be level. If it's not level, it will crack. Count on it. Cutting tile. 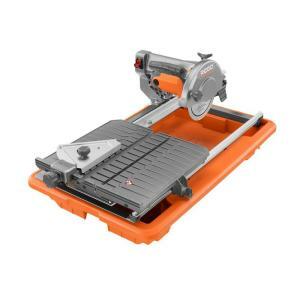 Ever tried your hand at a wet saw? Well, get ready. Odd shapes, corner cuts, splitting tiles -- it's all part and parcel of the wonderful world of ceramic tile installation. Heard of lippage? That's ceramic's tendency to warp and bow just a little bit so that the edges of the tile may not all be flush. Try placing a tile on a flat surface and see if you can give it a spin. That's slippage in action. Slap it down on the floor without knowing what you're doing and you could have a situation on your hands. (A certain amount of lippage is allowed by even the strictest professional tile installation standards.) How much is too much? What can you do to mitigate the worst of it? I guess you'll just have to find out for yourself. Pipes? Drains? Shower pans? Yep, each is it's own unique challenge that's no problem for a pro but may be a problem (or two or three) for you. Floor tile, wall tile, trims and listellos, bullnose, inside corner, outside corner - different sizes, shapes, styles, thicknesses. You'll figure it out. Fail in any of these areas and you can ruin the entire job. Yes, you can definitely DIY ceramic tile and because it is one of the most expensive floors to install, you'll likely save a lot of money doing so. Be careful though, you could be getting yourself into more than you bargained for. And that's no bargain, after all. Ceramic tile installation is messy, dirty, exacting work.